Medical marijuana is legal now in Georgia. So how do we get it here? Daniel Macris stands in the sunshine of the Sierra Nevada foothills in Northern California, dangling a fresh marijuana plant from his latex-gloved fingers. It’s a brilliant day in May. With tiny scissors, he snips off the leaves, keeping just the flowers—gnarled little mats of purple and gray-green filament coated in tiny white orbs, which contain all of the chemical compounds that we associate with the plant. Typically that’s tetrahydrocannabinol, or THC, the psycho-active substance that produces a high. The Halcyon Organics team in California. From left: Jeff, who requested to use his first name only, Joe Salome, and Daniel Macris. But this particular bud has very little THC. It doesn’t send the user into fits of uncontrollable giggles or into the woods to ponder the meaning of life. 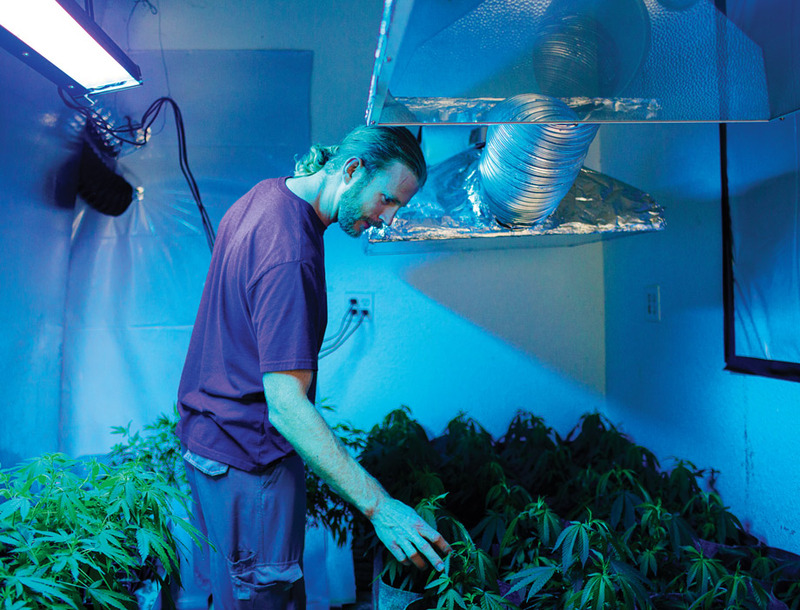 For two years, Macris’s company, Atlanta-based Halcyon Organics, has been growing cannabis plants in California (where it’s licensed) that are low in THC and high in another chemical called cannabidiol, or CBD, which is nonpsychoactive and is used to treat a laundry list of conditions—controlling seizures in epileptics, for example, or reducing inflammation in Crohn’s patients. Halcyon’s offices may be in Buckhead, but its chief production floor is 2,500 miles away, among the fertile acres here outside Auburn, California. 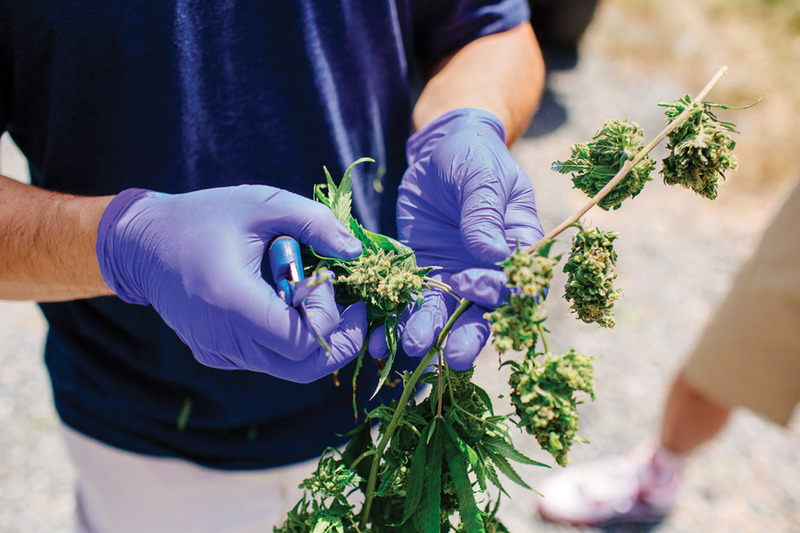 After the buds are trimmed and dried, Macris and his business partner, Joe Salome, will drive a sample to a lab in Berkeley, where it will be screened for contaminants and where its precise chemical breakdown will be established. Then the batch will travel down the Central Valley, to a processor in Modesto who uses a high-pressure CO2 extractor that pulls the essential oils from the plant. Once it’s bottled, this oil—rich in CBD, low in THC, and costing up to $250 an ounce—will sit ready for Georgia patients. There’s just one problem: There’s no legal way for anyone, patient or producer, to get cannabis oil to Georgia. In April, Governor Nathan Deal signed HB1 into law, making Georgia one of 39 states to pass some sort of medical marijuana law—in this case, allowing possession of less than 20 ounces of low-THC (less than 5 percent) cannabis oil. Only those who suffer from one of eight conditions (seizure disorders; Crohn’s disease; mitochondrial disease; and severe or end-stage ALS, multiple sclerosis, Parkinson’s disease, sickle cell disease, and cancer), and who have a state-issued medical card, can possess the oil. HB1—called Haleigh’s Hope Act, after one of the children affected—is perhaps most notable for what it doesn’t do, which is permit the cultivation of cannabis in Georgia. The law creates a dilemma for the very people it was designed to help: Yes, you can now possess cannabis oil for your medical condition, but because you’ll have to purchase it out-of-state, you’ll be breaking federal law by crossing state lines to bring it home. Nevertheless, people like Macris, who is 36 and started Halcyon in 2012, see HB1 as a landmark step toward what they hope will be an acceptance of marijuana into not just Georgia’s social fabric but its legal one. 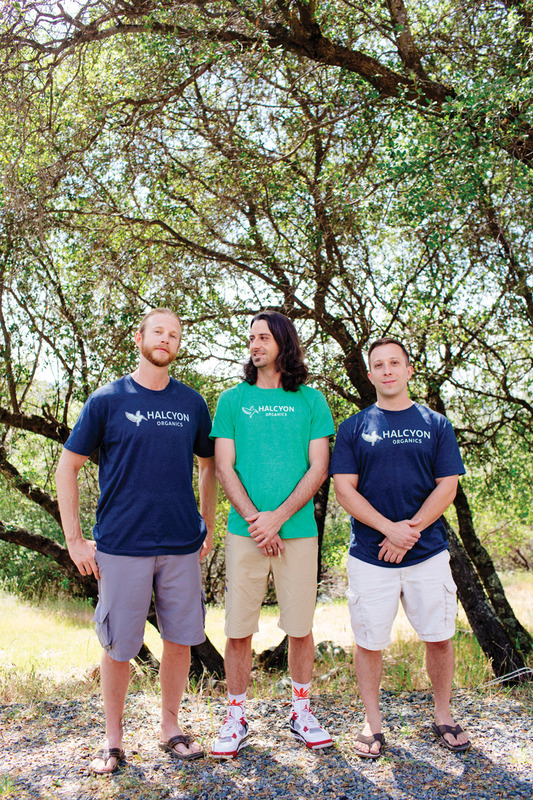 In California, Halcyon both grows pot and purchases it from contract growers, selling it to dispensaries there. In the wake of HB1, they’re working to find a way to get Georgia patients their product. After all, Halcyon is a Georgia concern, founded by Georgia boys. They even call themselves the first medical cannabis company in the South. Halcyon is banking on legalized in-state cultivation, which would mean a regulated, controlled system from soil to oil. It would also mean access to medicine for the half-million Georgians potentially eligible for medical cards. Until then Georgia lawmakers are trying to have it both ways: acknowledging the plant’s medicinal value while insisting that they’re giving no ground in the war on drugs. Pot. Weed. Reefer. Chronic. Trees. Bud. Herb. Grass. Mary Jane. If Macris has his way, all these terms—even marijuana, which is actually Mexican slang—would take a backseat to the scientific name, cannabis. Cannabis was one of the world’s first cultivated crops, but much about it remains a mystery. For one thing, the plant is terrifically complex. Of the 400 chemicals found in its biological makeup, approximately 60, including THC and CBD, are unique to the plant and are known as cannabinoids. In the 1990s, scientists identified cannabinoid receptors within the human body. When those receptors are stimulated, such as by the cannabinoids in marijuana, the effect can be seen at a cellular level. Most of us know the drug as an analgesic that lessens pain, but studies suggest that cannabinoids also have antioxidant properties, can kill cancer cells, and act as a neuroprotectant that may help ward off dementia. Even the U.S. government has conceded as much; in 2003, the Department of Health and Human Services was granted a patent for use of CBD as a neuroprotectant. The potency of the plant lies in its buds. Of course, like any drug, cannabis comes with risks. Although there are no deaths directly linked to marijuana overdose, studies have shown that it can alter the brain development of teenagers; cause impairment; induce panic or paranoia; increase heart rate; and, for 9 percent of users, be addictive. And we all know what a burnout looks like. In the eyes of the federal government, marijuana is a Schedule I drug, a category reserved for the most dangerous substances that offer, supposedly, no medical benefit. Heroin is in this same category. (Methamphetamine is Schedule II, considered less dangerous.) The designation makes government approval of scientific studies tricky, which may be why there has been so little medical research done on cannabis in the U.S., though that’s changing. Last year Deal announced two drug trials—currently ongoing—at Georgia Regents University, in collaboration with U.K.-based GW Pharmaceuticals. The medication, Epidiolex, is pure CBD (no THC at all), and is being studied on children with epilepsy. Some doctors, however, emphasize that the plant’s compounds should not be isolated, that to be effective they must work in tandem. They call this “whole plant” medicine. One such doctor is Uma Dhanabalan, a family physician and part-time Alpharetta resident. Not long after her mother was diagnosed with idiopathic pulmonary fibrosis, the two women saw a documentary on how Israeli doctors were treating lung disease with cannabis. It was the first time that Dhanabalan, who’d been practicing medicine for nearly 20 years, had ever heard of cannabinoid receptors within the body. She started researching cannabis’s use as a medicine and now is such a fervent believer in its efficacy that she opened a clinic last year in Natick, Massachusetts, that specializes in the field. “I’ve seen patients with glaucoma where their vision is improving,” she says. “I’ve seen patients with Crohn’s disease, ulcerative colitis, GI problems. Patients on chemotherapy, patients with lupus and MS whose quality of life is improving. We’ve seen elderly patients get off their blood pressure meds, patients who have insomnia, patients who have PTSD, patients who have depression, and the list can go on.” Nothing is really standardized; she says she starts dosing “low and slow” and works up. Not long after Ava Wilson was born in 2007, her parents, who live in Columbus, knew something was amiss. She wouldn’t eat regularly and often couldn’t keep anything down. She was having developmental delays in walking and talking. When she was two, doctors diagnosed her with mitochondrial disorder, in which mitochondria, tiny components that power your cells, fail to produce enough energy. Ava’s seizures began when she was five. At first they were tiny “drop” seizures—little nods that look like catnaps. But an EEG revealed Lennox-Gastaut syndrome, a rare form of epilepsy that is particularly drug resistant. She was put on an anti-epileptic drug called Topamax. Before long she was having 30 seizures a day and taking more medications—benzodiazepines this time, a class of strong sedatives that includes Xanax and Valium and that can be highly addictive. Then it was 60 seizures a day. An absence seizure, which comes with a loss of consciousness, had them rushing to the ER two summers ago. “She looked dead,” says her father, Chey Wilson. “She turned blue; her eyes were open.” And then the tonic seizures started, where the eyes roll back in the head and the whole body goes stiff, and then grand mals, the violent thrashing sort. The drop seizures increased to 100 a day. The prescription medicines knocked Ava out but did little for the seizures. “She was either asleep or seizing, and that was basically it,” Wilson says. “She had no personality, no nothing.” They tried a special diet for epileptics that is very high in fat and considered a last resort. It didn’t help. In August 2013, CNN aired a docuseries called Weed. Host Sanjay Gupta introduced viewers to the high-CBD, low-THC strain out of Colorado called Charlotte’s Web, named after a young girl with a rare form of epilepsy. After the telecast, demand for CBD oil surged, and families of sick children from all over the country moved to Colorado for the drug. The Wilsons began to hear success stories. A few months later, in the 2014 legislative session, Georgia state representative Allen Peake, a Republican from Macon, introduced HB885 in the General Assembly. It proposed legalizing cannabis oil for certain patients and organizing in-state cultivation. The Wilsons lobbied, but it did not pass. Ava and her mother, Jill, plus 16 other Georgia families, relocated to Colorado. Chey stayed behind for work. Peake connected the family with a fellow Georgia transplant, Jason Cranford, who had developed another high-CBD strain in Colorado called Haleigh’s Hope—named, as HB1 would be, for Haleigh Cox, a Georgia girl who also suffers from epilepsy. 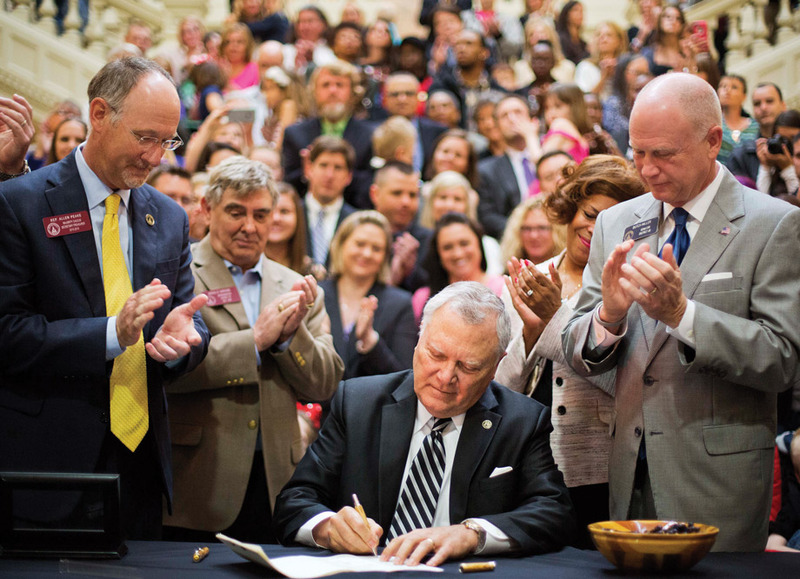 Governor Deal signs HB1 into law at the Gold Dome on April 16. State representative Allen Peake is at left. With the passing of HB1, Jill and Ava Wilson were able to come home. But three young seizure patients who were a part of the lobby the year before did not live to see it passed. While many might fear the dangers of moving forward without more research and regulation, delays can be a matter of life or death. Back in Columbus with cannabis oil and a medical card, Ava’s seizures are mostly under control. Each time she runs out of her 20 fluid ounces—every few months—one of her family members travels to Colorado to pick it up, then discreetly transports it back to Georgia. It takes at least a full day—the drive from Columbus to Hartsfield-Jackson, the three-hour flight to Denver, the rental car and hour’s drive to Longmont to Cranford’s office for the drug, and then all again in reverse. Sometimes Ava’s grandmother goes. Sometimes they drive. It’s around 1,500 miles, or 22 hours, one way. Some producers will ship the drug in the mail, under the radar, but not Cranford. With each trip, the Wilsons risk arrest. That said, so far there is no evidence of any arrests for shipping or transporting these low-THC oils, according to Mike Liszewski, policy director for Americans for Safe Access, which lobbies for the legalization of growing and distributing medical cannabis. But Liszewski also points out that these laws are new, and that arrests may yet occur. So the 500,000 potential beneficiaries of cannabis oil in Georgia have a choice: buy illicitly, or run the risk (and incur the expense) of supply runs out-of-state. “I’m worried families will do whatever to get it—that they’ll make decisions based on ease of access” rather than safety, Chey says. James Bell, a lobbyist and founder of the Georgia CARE (Campaign for Access Reform and Education) Project, agrees. “It’s just bad legislation,” he says. “It should have dealt with the issues of in-state growing. Now people are forced to smuggle product into Georgia. Another concern is creating a new black market, putting patients and families at risk.” Without any regulations on where the drug comes from, patients could end up with too much THC, too little CBD, or product tainted by mold or solvents that could make them sick. For other families, the 5 percent cap on THC is simply too limiting. Tripp Oliver, a five-year-old Commerce native who has a seizure disorder, did not return home from Colorado Springs with the passing of HB1. High-CBD oils don’t work for Tripp. He’s taking another nonpsychoactive compound, known as THC-A, still illegal in Georgia. HB1 also created the Georgia Commission on Medical Cannabis. Composed of 17 lawmakers, lawyers, medical experts, and state officials (many appointed by Deal), its role is to develop recommendations for possible in-state cultivation and distribution. Its findings could result in legislation in 2016. A taxed and regulated industry could have a significant economic impact on Georgia. One local study last year showed the potential of $200 million a year in revenue from in-state cultivation and distribution. The study was commissioned by Surterra Holdings, a local investment firm looking to consult on business models for manufacture and distribution. Surterra also polled 400 Georgians and discovered that 80 percent supported medical marijuana. One thing is clear: Recreational use is off the table. Jeff checks on juvenile plants at a grow in California. Green lights allow the plants to “sleep” during the day. “Wanna see some plants?” Jeff (who asked to be referred to by first name only, citing federal drug laws) says with a smile. Jeff is one of Halcyon’s contract growers in California, and the company’s “horticulture specialist.” He’s also a Georgia native—he grew up in Kennesaw and graduated from UGA—but he’s lived in California for eight years. Jeff is standing with business partners Macris and Salome in the kitchen of his home, a blue wooden guesthouse on a slope overlooking low hills of Ponderosa pines and horse pastures. There’s not another structure in sight. It’s still spring, but already the trees and shrubs crackle in the drought. The front stoop is decorated with a generous swatch of Astroturf and Coleman camping chairs. Inside, a few fresh plants hang to dry on a string. Workout mats take up the central floor space amid exercise balls and a dogeared Yoga Beyond Belief. 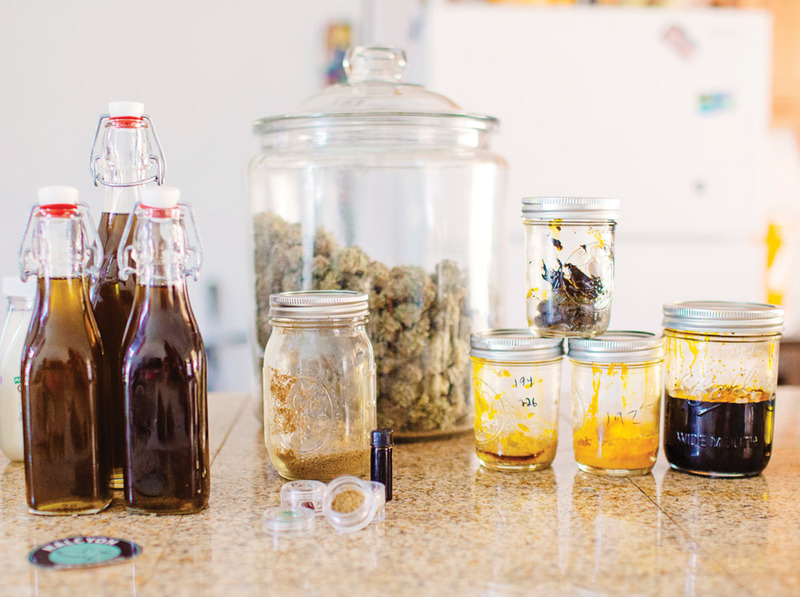 Spread out across the kitchen counter are varieties of cannabis in every form. Halcyon also sells higher-THC weed for the California market, like the pound of Blackberry Kush nuggets in a glass jar the size of a water cooler that sit, ready for sale to a dispensary, alongside CBD oil in vials, vape pens, capsules, infused olive oils, lip balms, body salves, ingestibles, and concentrates. Halcyon buys from around five contract growers. Jeff’s place also serves as a makeshift laboratory, where they develop new strains, a process that involves applying pollen from a genetically male plant to a female plant to create a hybrid seed. This time of year, all harvests are coming from indoor grows, which operate year-round; outdoor crops mature in the fall. Jeff pulls on a headlamp and opens a door off of the main room into darkness lit by a green light. “Plants don’t see green,” says Jeff, who spent a semester studying weed horticulture at Oaksterdam University in Oakland, which sounds like a joke but is the country’s first cannabis “college.” Curriculum includes soil science, flowering, and plant propagation. During the day, the plants “sleep” in the dark; it’s more energy-efficient and cost-effective to light them overnight. A flipped switch at the wrong time could confuse them into thinking it’s time to wake up. In one room, fledgling plants grow from cuttings that are sprayed with something called cloning gel that helps them form roots. In another, more mature plants are lined on low tables, their spiky green heads softly rustling above string netting that supports them as they become top-heavy with buds. The Halcyon guys all coo to the plants, calling them “she” and “her”—all of these were genetically female. “I feel so bad when I have to kill them,” Macris says. Macris met Salome 24 years ago at Holy Transfigurations Greek Orthodox Church in Marietta, when they were in middle school. Salome had just moved to town, and the two served as altar boys together. “We’ve been friends forever,” says Salome, who is lanky and lean with long brown locks. He wears marijuana leaf–patterned socks. Both studied marketing. Macris graduated from UGA in 2003 after two years of classes in chemical engineering at Georgia Tech, and Salome finished at Kennesaw State in 2004. In California, Halcyon displays an array of cannabis products, including oils, concentrates, cannabidiol powder, and a pound of dried Blackberry Kush. Halcyon isn’t their first business. Macris also owns an ecofriendly house-painting company called GreenWave Solutions, and Salome started Social Joe Marketing, which does brand development and communications for companies like Piece of Cake, the bakery that houses Halcyon’s offices. His motto, plastered across the top of his website, reads, “Where there’s smoke, there’s Social Joe!” The pair are gabby and casual, preferring Braves caps and jeans or shorts—if you met them, you might guess they worked for a young tech company, a MailChimp or a Scoutmob. They launched Halcyon in 2012, more than a year before medical marijuana legislation was even a glimmer in Peake’s eye. Since then, Macris has been back and forth to California getting the business off the ground. 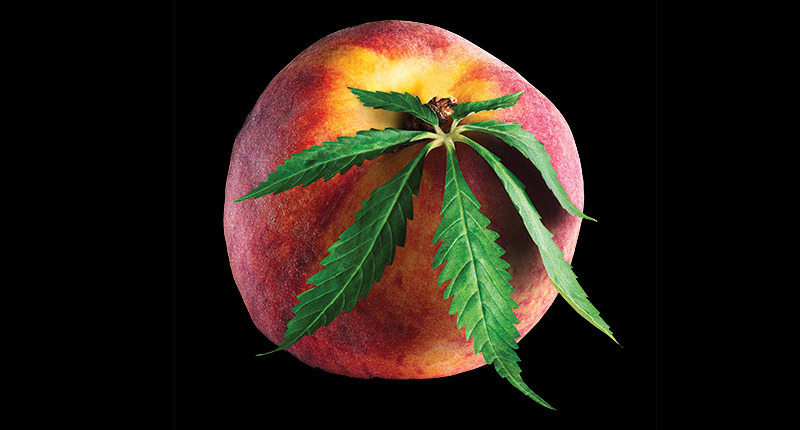 The goal is to gain enough experience to win a license to operate in Georgia, if in-state cultivation is permitted. Halcyon’s branding, with its modern font and sage-colored kingfisher, suggests yuppie, not hippie. Macris argues that the way to get mass approval in Georgia for cannabis is to make it look and feel upscale, medicinal, official—the antithesis of the Rasta-flag-waving, bongo-drum-playing, sandal-wearing stoner culture. It’s about marketing. The website features the “strain of the week”: Afgoo! White Widow! Trainwreck! If Halcyon develops its own strains, Macris would rather the names sound a bit less aggressive. Now, inside the grow room at Jeff’s house, lamps hover just above the tops of the plants, and ducting runs through them, sucking out the heat. Fans hum. The walls are heavily insulated. In a back room, hoses fill rain barrels with water, while little gadgets determine pH level. A shelf of nutrients is organized according to the plants’ stage of life. “It’s a full-time job to grow a good plant,” says Macris. Halcyon isn’t the only local company with designs on getting medical marijuana to Georgia. Stephen Bradley started WeedBiz.us and is editor of SouthernCannabis.org. He also cofounded Healthy Hopes, which aims to source CBD oils with 2 and 3 percent THC by the end of summer; he plans to get those oils in the hands of card-holding Georgia patients. “The moment you get involved with pot, there’s risk,” he says. “You just try to minimize it. I don’t know if what we’re doing is going to work, but when you weigh the risk, well, you’re putting it in the hands of people who so desperately need it. “I don’t know; they may come lock me up tomorrow, but I do believe they have bigger fish to fry.” He would know. Until 2011 he was a sergeant in the Forsyth County Sheriff’s Office, busting low-level drug users while trying to find informants. But he’s emerged as a marijuana activist and a speaker for Law Enforcement Against Prohibition, a consortium of current and former cops who are against the drug war. On June 16, in a bland legislative office building across the street from the Gold Dome, the Georgia Commission on Medical Cannabis held its first meeting. Nathan Deal was supposed to be there to swear in the members, but he was on an economic development trip to Brazil. A lot of other people came, though: There was the guy in the skullcap who yelled something about freedom as he walked through the metal detectors. There was the pair handing out leaflets at the door. There were the patients who came by wheelchair. There were caregivers, parents, even doctors. And there were entrepreneurs, like Macris and Salome, who came in navy suits to sit in the front row. Such is the eclecticism of the marijuana constituency. Then there were the 17 members of the commission, seated in a semi-circle beneath the state seal. Representative Allen Peake, leading the charge. Medical and pharmacy professionals. GBI head Vernon Keenan, his Panama hat on the table in front of him. Commissioner of Public Health Brenda Fitzgerald. Paulding County Sheriff Gary Gulledge, among others. That morning, two months after the signing of HB1, the Department of Public Health had opened the registry to patients eligible for medical cards, effectively putting the law into action. That the meeting was happening at all was a tangible sign of how seriously the state is taking the future of medical cannabis, as cockeyed as the law may be now. Peake had lined up a key speaker: Liszewski, the policy director for Americans for Safe Access. Liszewski had been called in to help recommend a system for Georgia, as he does throughout the country. No one was surprised when he outlined the problems with the current law, but people perked up when he showed how the state stacks up against others. Georgia got its registry up and running in an impressively short time. Of the 16 states with high-CBD-only laws, Georgia’s is among the most robust, with its allowance of 5 percent THC. The possession limits, Liszewski said, are “workable.” At the federal level, he said, the DEA has been discouraged from making busts in legal states, and the approval process for cannabis research has been slightly loosened. Even law enforcement—historically in opposition to legalization—seemed amenable. After all, how long can the state stand behind a system that makes smugglers of its citizens? Keenan asked about his role under a potential new system. Gulledge asked whether universities could control the grows, but Peake pointed out that universities don’t want to be involved because of federal laws. Maybe Georgia is moving faster than we thought. Why can’t we grow medical marijuana in Georgia?